The Westside Market chain of stores in New York City is a very upscale store found mostly in higher-income neighborhoods and sells mostly gourmet foods. 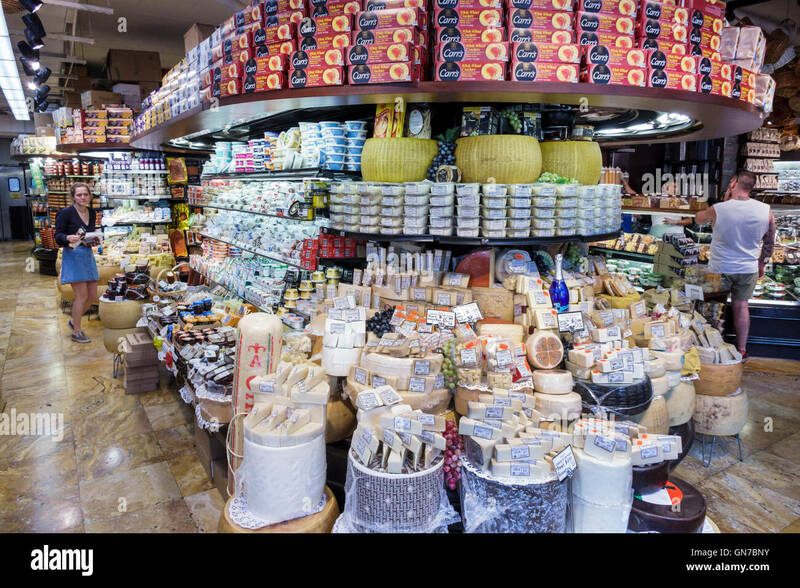 This gourmet store is one of the best around and the use of space is incredible. The prices are on the high side, but the products are really worth it. Westside Market is a member of White Plains, NY-based Krasdale Foods, a cooperative that also runs lower-end C-Town and Bravo stores. I don't know if anyone's ever been this happy to eat Krasdale products. Lol, I don't think anyone ever will be that happy to eat Krasdale products. It reminds me of when the Food Emprorium opened in Garwood-- this reviewer on Yelp of GMaps noticed a KeyFood product on the shelf-- and ran away from the store, because he knew KF sucked! Also doesn't the Krasdale logo remind you of the Pathmark outline? I've tried a few different Krasdale products. Most were OK, but at least one (the lemon juice) was awful. Krasdale's come a long way, but their quality is mostly inconsistent. Key Food tends to be a higher quality storebrand, more on the level of a ShopRite brand or so. All the big chains (ACME, Stop & Shop, Kroger, etc) have better and more extensive storebrands. And it's funny, I actually observed the exact opposite response at the (now-closed) Superfresh in Edison--a couple was shopping, and the wife said to the husband, "Look, honey, it's Key Food!" (They probably knew KF from somewhere else.) Personally, my own opinion is that KF stores vary wildly from owner to owner; Garwood and Edison were both owned by Kevin Kim, who doesn't tend to run as good stores as, for instance, the Food World group (Belleville, Bloomfield, Roselle, and others). And yes, I've thought the same thing about the Krasdale design! When you said "Look, honey, it's KeyFood!" I was drinking water, I literally spit it out onto my computer... hilarious! I agree, when markets are owned independently, there's no quality control. For instance, I live near two IGAs-- around two hours away from each other. The Frenchtown IGA, a former centennial A&P, has not been changed, and is rather... old and smelly. Meanwhile, the Dublin IGA, a well-maintained former Shop-n-Bag, has a completely different look alone, but the selection is different, and a lot fresher than the Frenchtown location. One thing that I really like about Key Food (is that for the most part) they use the same decor store to store, making it seamless for the customer. And since when did the Edison Superfresh close? Man, Kevin Kim has to get his game on! It seems like every Key Food that you cover on your blog closes after I read the article... It's all because (I think) of Key Food's Identity Swap / New Skin. They have not yet gotten down the real part of being a banner... many circulars still say "Key Food" instead of "Superfresh" or "Food Emporium". If Key Food opened up their Food Emporiums with different decor entirely (along with Superfresh), with different circulars (which they have just started doing), and absolutely NO PRESENCE of Key Food inside. I find that in many of these old A&P's Key Food puts out a logo floormat at the exit... which is (ironically) smart, 'cause then the customer doesn't know it's the same awful store until they BUY SOMETHING! Something that I have to give ShopRite kudos on is their new "Wholesome Pantry" or something like that... their Maple Syrup is cheap, and really good. The Edison Superfresh has been closed since October. It's still vacant as far as I know. And I think Key Food's difficulty is differentiating the banners. Because in reality, what's the difference between a Key Food and a Food Dynasty? Or a Food Universe and a Key Food Marketplace? Or really any other combination of Key Food banners? The Food Emporium stores have become basically Key Food stores, and really the only thing that sets Superfresh apart is size. 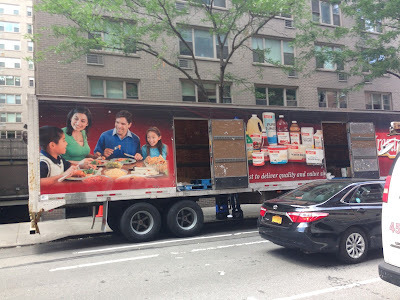 And I think the process of removing the "Key Food" from the other banners is already in motion--the storebrand is becoming Urban Meadow instead of Key Food. I have to give the Superfresh in Irvington a lot of credit on this. It's a well-run store and is a SUPERFRESH. Only the storebrand products say Key Food--the rest is all Superfresh branded. The truth is I'm at a different store every week. The closest supermarkets to where I live are a ShopRite (really good, but too crowded) and a Kings (mediocre products and crazy prices). I really enjoy shopping Food Bazaar, but the nearest one is half an hour away. And ShopRite is always reliable, but the quality of store varies from owner to owner. Huh, 'cause it seems like I keep seeing the same decor with the bold, backlit letters. I agree about the differentiation of the brands. They need to have varied selection, quality, and price. Because (heres an example) lets say I buy something at Walmart for $3.97 a pound. Not knowing that Sams Club is part of Walmart, I go to one of their stores. I buy the same thing (with brand) for the same price of $3.97 a pound... I can obviously tell that this is from Walmart because the Walmart Companies mainly use prices that end in 97, 94, 88, and 78. I agree that the Superfresh in Irvington is well-run. It's funny that you say that your local ShopRite is very busy because that's exactly why I don't shop there. King's is nice; but the nearest one to me is in Morristown. We stop there whenever we're in the town... ridiculously overpriced, I remember they had a Dasani Water 24pk for around $10-12... really? The single Redner's I went to (Easton, PA) was great--reasonable prices, very clean, and a pretty good selection. I remember that I would shop at a Redner's if there was one around. Plus, it's a local company and employee-owned, so those are all advantages. Your ShopRite is Phillipsburg, right? That's one of the newly-renovated ones owned by Joe Colalillo, who's also the CEO (president?) of Wakefern. I've been to Yardley and Bethlehem and I really liked both, but they were both very crowded. Funny, I live near that store, but never go to it. I usually go up more towards the Quakertown area. They have great deals there, and their produce is great. Yes, my ShopRite is in Phillipsburg. I didn't know it was owned by the CEO! I've always seen the "Colalillo" cart corrals in the lot. It was recently renovated; and reminds me oddly of the PF&H decor package, except with some Albertsons Marketplace boxes pushed in. I've never been to the Bethlehem one, but I remember when it opened. I recently went to the Wegmans there... BUSY AS THE NEWARK AIRPORT. It's actually the first time I was in a Wegmans, lol, but I wasn't impressed. Their breads were a little bit above the new Nature's Promise / Simply Enjoy breads at S&S.